Still looking for the perfect gift for a family member or friend? In addition to some of my favorite things in the Bella Eats Store powered by Amazon, I wanted to share some of my favorite hand-crafted and vintage finds on Etsy. If you haven't shopped on Etsy before, beware. This little site is incredibly addicting. 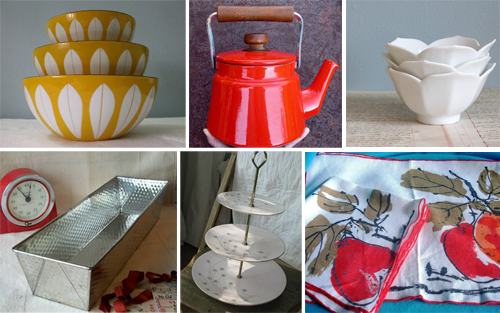 Buying handmade and vintage pieces from individual artists is very, very satisfying. How completely adorable are these aprons?!? Just about as cute as Joy herself. Who wouldn't want a little bit of Joy, and her mom, in their kitchen? I've coveted tea towels from Skinny laMinx for what seems like years. Her original drawings, screen printed in bold colors on hopsack, would brighten any kitchen. I love these abstract illustrations screen printed on 100% linen. I think the "collander" design is my favorite. I have an unhealthy obsession with all things felt, and these coasters are no exception. They come in a slew of fun colors, in round and square shapes. I love these simple cake and cupcake stands with a touch of whimsey, and the lotus bowls...*swoon*. When I think of napkin rings, I think of fancy, fussy parties. This more casual, personal option is much more suited to our home. I like to think that even though we live in a digital age of electronic recipe files and iPhone apps for cooks, that I would still sit down and write out my favorite recipes on cards for a friend. I think that these adorable letterpress designs would help to motivate me. Hannah's photography is stunning. If you aren't following her blog, you should be. There are so many fantastic vintage pieces to be found on Etsy. I've included some images and links to my favorites available right now, but chances are they will all be gone soon and replaced by other great finds.